In the last few years, I have been a bit obsessed with pairing red and gray in my outfits. I think I like how the red makes a relatively drab outfit pop with color. I also think it also comes down to the fact that these colors look great together. During the Fashion Challenge, I never took a picture when wearing this dress, so I decided to post one when I wore the outfit on Thursday. I can't believe I have not worn this dress since August of last year! The dress is from the Bloomingdale's brand, Chequer, and it is a gray sheath dress with black seams and zippers. It's a simple dress, but it looks so professional, and I will get random compliments when I wear it. I once wore this outfit on a plane, for example, and the stewardess exclaimed how cute I looked. I definitely think the shoes (Stuart Weitzman Low Key Red Patent Flats) and the bag (Nine West Follow Me Clutch) help, which are both in a bright red. I usually wear bright red lips to match as well. My shoes are actually so shiny that you can see the reflection of the white baseboard in the photo. You can also see in this photo that my nails and toenails are painted a navy blue. Blue is one of the "in" nail polish colors this season, and I think they look so cool. Maybe I will try a lighter blue shade next time. Lately I have been getting gel polish on my fingernails. This so-called two-week manicure lasts for about two weeks without chipping. It's difficult to get the polish off, but I think two weeks of chip-free polish is worth it. Usually my nails chip about an hour after I leave the nail salon. The trend started a few years ago, but I only tried it for the first time this year, and I'm hooked. I actually took Chapin for his first ever pedicure this past weekend, and he sure did enjoy it. It's been almost a week since our visit to Passion Nails on North Highland, but Chapin is still commenting about how shiny his toenails look (the pedicurist gave his nails a good buffing). His overall comment on the experience: "It was quite pleasant." 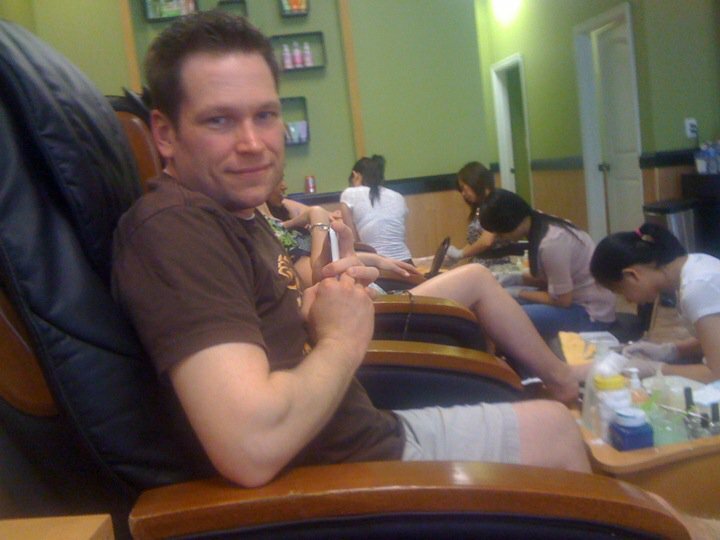 It is actually not uncommon to see men in the nail salon. I guess the boys like to be pampered, too!